Abstract This study was conducted to evaluate the effects of unsaturated fatty acids on ultraviolet-induced hyperpigmentation of the skin. An efficient lightening effect was observed following topical application of linoleic acid or α-linolenic acid to UV-stimulated hyperpigmented dorsal skin of brownish guinea pigs. 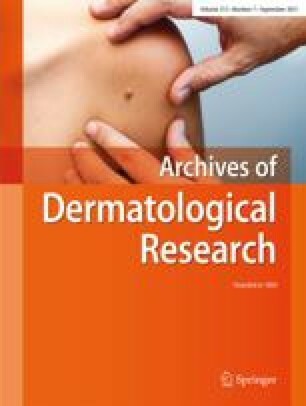 The number of melanocytes in the treated skin was similar to the number in the skin of the pigmented control, indicating that the pigment-lightening effect was not due to depletion of melanocytes. In vitro experiments using cultured murine melanoma cells showed that melanin production was inhibited most effectively by α-linolenic acid, followed by linoleic acid and then by oleic acid. Furthermore, the turnover of the stratum corneum, which plays an important role in the removal of melanin pigment from the epidermis, was accelerated by linoleic acid and by α-linolenic acid. Taken together, the results suggest that the pigment-lightening effects of linoleic acid and α-linolenic acid are, at least in part, due to suppression of melanin production by active melanocytes, and to enhanced desquamation of melanin pigment from the epidermis.